Mi Note is one of the best device from the Chone company Xiaomi and most of the android users already bought the same and happy with the device. But most of them don’t like MIUI OS and want to switch on some other ROM. 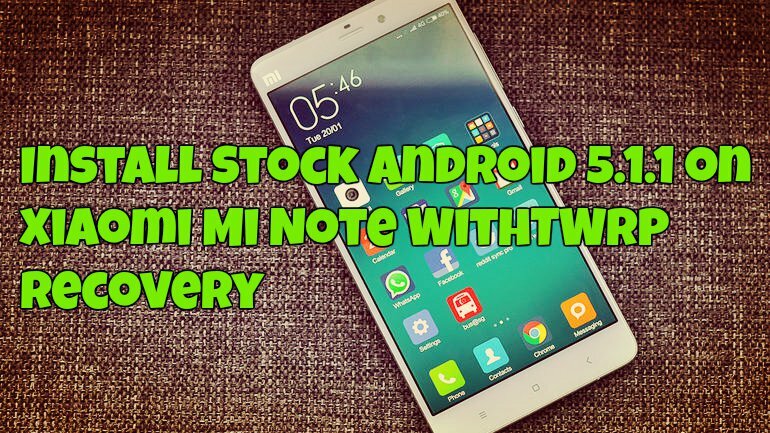 Now the Stock Android 5.1.1 Lollipop is available for the Xiaomi Mi Note users. It’s a pretty simple build of Android 5.1.1 and comes with only stock apps, no bloatware or any other unwanted application. Most of the user already tested the new ZStock ROM on their note and they are happy with the performance fo the device. All credit goes to the MIUI Forum member IVAN, who ported this ROM for the Mi Note users. If you want to update your Note with Stock Android, then read the below mention instruction and update the same. This Guide is only for the Xiaomi Mi Note users and not for the NOTE PRO users. Don’t forget to back up data before flashing the ROM file on your device. Read all the instructions very carefully and follow them step by step on your device. Step 1. Setup ADB and Fastboot drivers on your PC here and this will create an ADB folder on your C drive (C:/adb). You need these files to flash the recovery on your Note. Step 2. Download the TWRP recovery here and place in the ADB folder that you created in Step 1. Step 3. Now Download the Stock Android 5.1.1 here and save it on your device internal memory. Step 5. Now connect your Mi Note to the PC with USB cable and Open the ADB folder where you saved the recovery file in step 2. In the folder press the Shift key on your keyboard, right click in the folder in the blank area and select Open Command Prompt Here. Step 7. First boot into recovery will not show anything, just wait for it to load. This is because recovery will be flashed to system 1, and will only be able to use on system 1. Please select and reboot on system 1. NOTE: – The build of TWRP is in the Chinese language, although if you are familiar with TWRP this shouldn’t matter for basic functions. Step 8. Now from the TWRP recovery, Select Wipe Data to clear all data. Do not choose to format data in Advanced Option. Step 9. After this go back to the main page, choose installation zip and flash the Stock Android 5.1.1 ROM. Step 10. Once complete, select Reboot System Now >> Yes. Now your Mi Note is running on the Android 5.1.1 Lollipop.